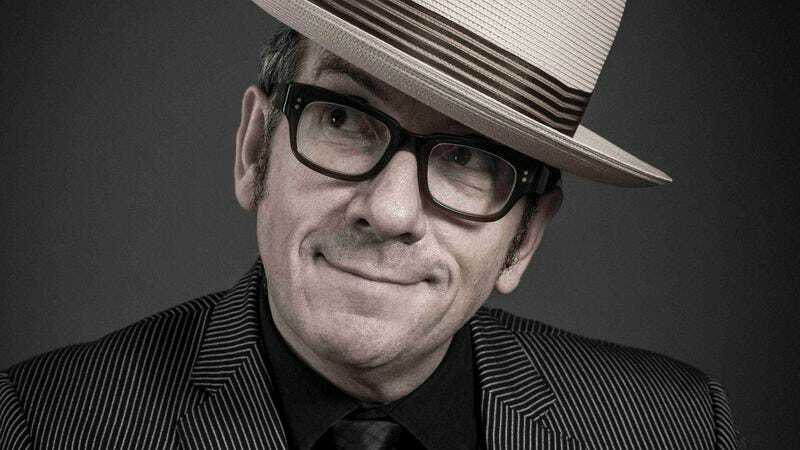 Elvis Costello’s new memoir, Unfaithful Music & Disappearing Ink, is a whirlwind tour of Costello’s life as a rock musician, son, father, television host, and songwriting collaborator with Paul McCartney and Burt Bacharach. Like his music, Costello’s book is equal parts acerbic and heartfelt, giving scope to the many stylistic detours he and his fellow musicians have taken since his start in the mid-’70s. Elvis Costello spoke to The A.V. Club about those detours, faulty memories, and collaborating with childhood heroes. The A.V. Club: You say in the book that you’re not a nostalgic person. Can you write a memoir without nostalgia? Elvis Costello: I think you can. I think you can evoke things that matter to you and try and work out how you feel about them now or, in the case of this book, where they may have led me. Music I heard as a child that suddenly felt more vivid to me. All of that’s what I’m describing. It’s more those emotions and sensations of hearing music than it is some sort of analysis. AVC: Was there anything in the book that surprised you, either because you had forgotten about it or because it carried so much weight with you? EC: I think there must have been numerous things, because otherwise, if it wasn’t engaging to your own feelings, I don’t suppose you could see how to write it at all. And sometimes, like any piece of work, you get frustrated and want to lay it aside, and I had some friends who said, “No, don’t do that. Maybe you should just get up and walk around the room.” Or I would be given the opportunity to get some perspective on what I’d done in a certain period of time by the fact that I have another job—playing some music that was recorded on the tour, playing shows. I’d look at the way the songs accumulated in one night and it would tell me something about the way these experiences had all been of value. I’d go back and it would be a little clearer, the way I needed to evolve something. AVC: Was your approach to writing the book similar to the way you approach songwriting, in terms of the work ethic involved? EC: Well, the work ethic involved in songwriting is just responding to the idea that’s coming into your head, so songs can come in fully formed, or they come in like a couple of lines that you happened to fill. You have some sort of thought, write it down, and it might stay in a notebook for half a year or several years, or three weeks, and maybe because our minds tend to go around some of the same ideas, it might take a while to get to the rest of the words. Obviously with something like this [book], it’s a bit different. You’re starting to tell a story, and then it’s whether the story is an end to itself or whether it leads somewhere, it’s whether you complete that chapter. You’ll notice that a lot of the chapters begin describing a scene, and then they seem to travel somewhere else, but it’s not random. If you read on, you’ll see where it eventually kind of concludes. I had to think about how it would all pay off. And I took out anecdotes that didn’t lead anywhere, even if they were funny. If they were just an end to themselves, they didn’t necessarily add anything to the ongoing story. Otherwise it would just be a compendium of little tales. AVC: Did any of those end up as that spoken word bonus track on the compilation you released in conjunction with the book? EC: Exactly. I knew a couple of them were worth hearing, but they didn’t fit into the book as such. Where they had originally resided in the book, I took them out. There’s various scenes with Paul McCartney talking about our demo recordings. I just like this idea of having this handwritten contract that neither of us have acted on. The thing is, I couldn’t remember what bloody book I put my half in [for safekeeping]. It’s just typical. AVC: Did you ever find it? EC: Well, I moved house after that, so I’ll have to go through every book I own. I’ll find it one day. Maybe I put it in a significant book, like maybe it was connected. But you never know. [Laughs.] Maybe I put it in some textbook or something. AVC: Your book is a reminder of the many collaborations you’ve done. What do you get out of collaborations that you can’t get from writing by yourself? AVC: Does that apply to both performing and writing? EC: If you do anything for forever and a day, it’s going to seem mundane. One of the curiosities of having a long career is people wanting to hear songs you wrote in the beginning; I personally don’t want to play them for a cheap round of applause. I always want to feel like there’s still something alive in those songs. I’ve got to work out how to do that. AVC: You write in the book, “It probably seems curious that I ended up making four times more albums for [classical label Deutsche Grammophon] than Stiff Records, but once you peel the label off the jar, they are all just vessels containing the entrails from experiments… It’s only music.” Is that what you’re getting at? EC: That was one way of putting it. I’m not an idiot. [Laughs.] I know that some things I do are going to horrify some people. They mistrust your motives for doing these other things that aren’t rock ’n’ roll combo music. It’s kind of self-aggrandizing. It’s not like getting into those other games guarantees you anything. In fact, there’s just as much disdain coming from the classical side, because they mistrust the motives of the people coming in. They think we’re all on easy money in rock ’n’ roll, and we don’t have any talent, at least coming in. But then they sort of realize that actually, I mean what I’m saying. I mean what I’m writing. You actually have to pay attention if you want to play it well. AVC: You wrote about the incident in Columbus very eloquently, as you did for the Get Happy!! reissue liner notes a few years back. What does it feel like to write about it now? EC: The first thing I’ll say is that I choose my words carefully. I wrote about it with a particular care because I’m aware that some people can’t get past this because they have all kinds of misapprehensions. They just hear this reputation from the past with my name without hearing the context. So knowing that it’s so long after the fact, how many times can you make yourself plain before people will take you at face value? So I’m reluctant to unpick it and undo the work I tried to do in the book. And as you’ve said, I’ve written about it before, I think quite clearly. But that obviously requires you to want to buy an album and happen upon that account. There’s a bigger chance of a book resonating out because people will excerpt or will refer to that chapter because that’s one area of interest, in all the stories of all the things I’ve done. That’s 10 minutes in 1979 that could shout louder to some people than everything else I’ve done. But the brevity of the chapter should not deceive anybody into thinking that I think less about it or have less intense feelings about it. But I am done explaining it, you know. And I don’t think that’s an arrogant position to take, because once you write about something clearly—including the impatience that I had with people who were, even in the immediate aftermath, willfully misunderstanding what I was saying by way of trying to explain. I think it’s very hard to explain how you can contradict yourself, because you’ve brought yourself into that corner. None of that is anything like an excuse. And I said those exact words in the book. AVC: It’s interesting that word about the incident traveled so quickly, which is something that we tend to associate with the modern digital era. EC: Well, there’s nowhere near the speed [as] now. There are so many things that happened in the past that would have affected people very, very differently if we’d had the modern forms of media. It isn’t necessarily better. Even in the last week, this chapter, among all the other ones in the book, has drawn comment. People have drawn attention to the fact that even now, people don’t know what’s being said or what really happened. They’d only heard the hearsay. They even have the names of the participants wrong. Frequently Bonnie Raitt is involved, who’s a friend of mine. [Laughs.] They have the wrong names. I mean, it’s understandable. It’s also a tremendously long time ago. That doesn’t make anything that happened less offensive if you read it in cold print. But it does make it your responsibility before you repeat something to actually know what you’re saying, or perhaps go to a more reliable source than hearsay. AVC: The quote that opens the book is from your song “All The Rage,” about invisible ink (“Don’t try to touch my heart, it’s darker than you think/And don’t try to read my mind, because it’s full of disappearing ink”). Did you use that image in the title because of the inherent unreliability of memoir, and of memory? EC: Well I think the final payoff and the part of the line that is employed in the subtitle to unfaithful music is the presence of memory and the doubts of memory. Both my grandfather and father, their last years were marked by the loss of comprehension and memory because of dementia. That will obviously put some doubt in your mind. If nothing else, I knew that there was a sense that I wanted to write things down. I have to say, way back, when I was wrestling with what [this book] was, I did go through periods of doubt, which you should do when you’re writing anything. One of the reasons to carry on was to make sure that my younger sons would have an account from me rather than hearsay. That would have been reason enough to have finished it.